It was all love at City Hall on Tuesday afternoon when the San Francisco Board of Supervisors presented a Certificate of Honor to Capt. Joseph McFadden, a longtime SFPD cop with a reputation for being tough on crime and involved with his community. Seven district supervisors in total stood up to compliment McFadden during the ceremony, which focused largely on his appointment to the General Crimes Unit last week. They praised him for cracking down on tough crimes, introducing much-needed reforms such as adding foot beat officers, and above all remaining deeply in touch with community members. “In my office, we called him McFaddy,” said District 10 Supervisor Malia Cohen, chuckling at the recollection of McFadden’s nickname. She said McFadden’s status as a San Francisco native made him sensitive to how the city has changed and continues to develop. Prior to assuming command of the General Crimes unit, McFadden served as captain of San Francisco’s Ingleside Station for 3 years. He has also worked in the department’s Domestic Violence and Officer-Involved Shootings sections, and tracked narcotics in the Tenderloin and Mission neighborhoods. Outside of the City Hall Chamber, a smiling McFadden told Mission Local he was pleased by the announcement of his reassignment, but not surprised. He described his new assignment to Unit Captain as “natural,” noting that as the original director of the officer-involved shooting investigations unit he’d had a lot of experience investigating crimes. “I could do it in my sleep,” he said. McFadden attributed his success and popularity as a police officer to four rules: Treat every victim the way you’d treat a relative, “back each other up,” take care of children and take care of the elderly. He also said officers in leading roles should “get involved in the community” and “take care of the troops,” or fellow officers. On this last point, McFadden emphasized the care he took to stay in touch with his roots. Though he has an office job now, he said he would never forget the time he’d spent doing grittier tasks for the SFPD—like raiding illegal gambling dens in the Tenderloin. “Kicking down doors, arresting people, that’s the fun part,” he said. Captain Denise Flaherty, who’s spent 25 years in the SFPD, was also honored. Flaherty was captain of Taraval Station before Scott put her in charge of the Police Academy. 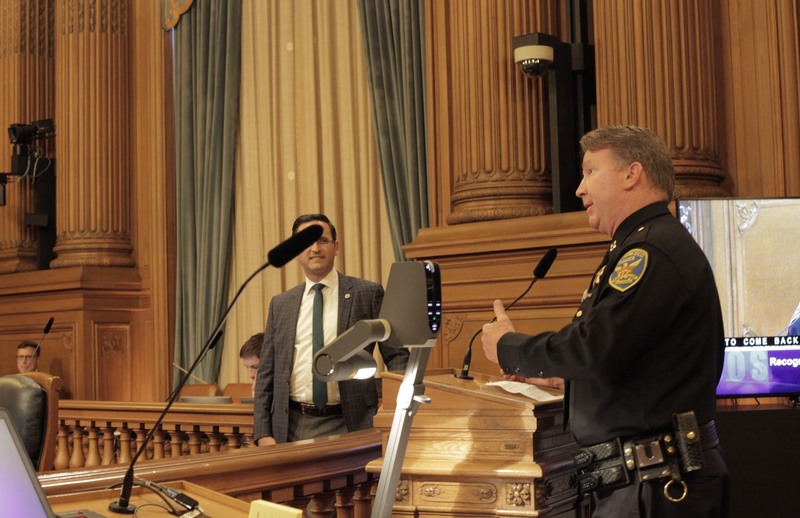 The appointments of McFadden and Flaherty came in a wave of reassignments by San Francisco Police Chief William Scott, who on October 16 announced 20 new positions for both new and veteran captains. In addition to the reassignments, Chief Scott said on Oct. 16 he would expand the department’s Investigations Bureau to include Robbery and Property units, which will focus on serial robberies and property crimes such as auto burglaries. These reforms come “as part of the department’s commitment to effective, data-driven crime-fighting initiatives,” according to an SFPD press release.